All of our animals are raised outside in rotating, 100% organic, managed pastures. Knowing the farmer is the best way to guarantee quality of process, so come up and meet us for a tour! 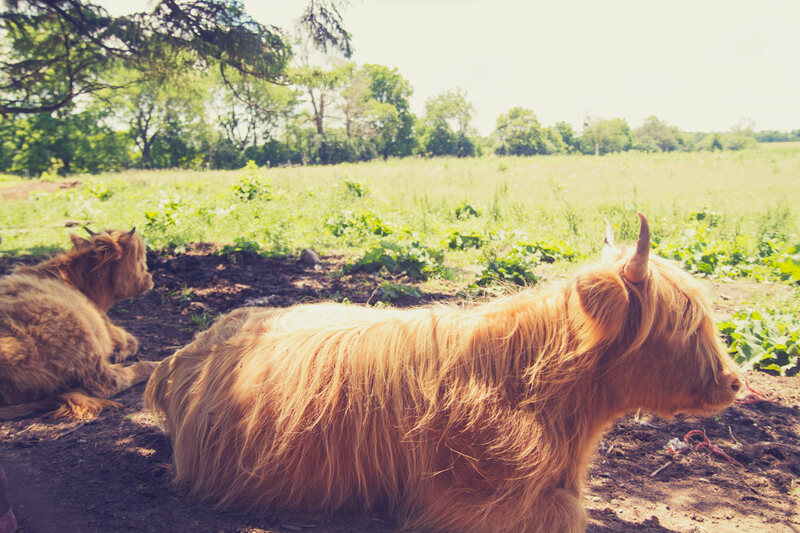 We raise and breed Scottish Highland (Longhorn) and Irish Dexter Cattle, Berkshire & British Large Black Pigs. WE HAVE 2 TYPES OF PIG; BRITISH LARGE BLACK & BERKSHIRE. 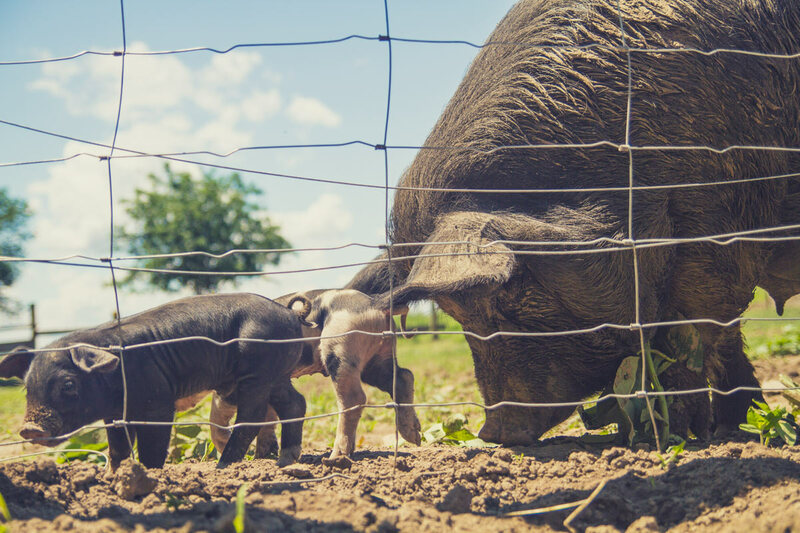 One of the rarest breed of pig, prized for its placid temperment, delicious taste, & gigantic size, Large Blacks are excellent mothers and represent a time when taste governed the marketplace! Perhaps England’s oldest breed of pig and is prized for its juiciness and marbled flesh, Berkshires are quicker to mature and are becoming quite popular again among foodies and chefs. Our pigs are raised outside under the light of the sun. 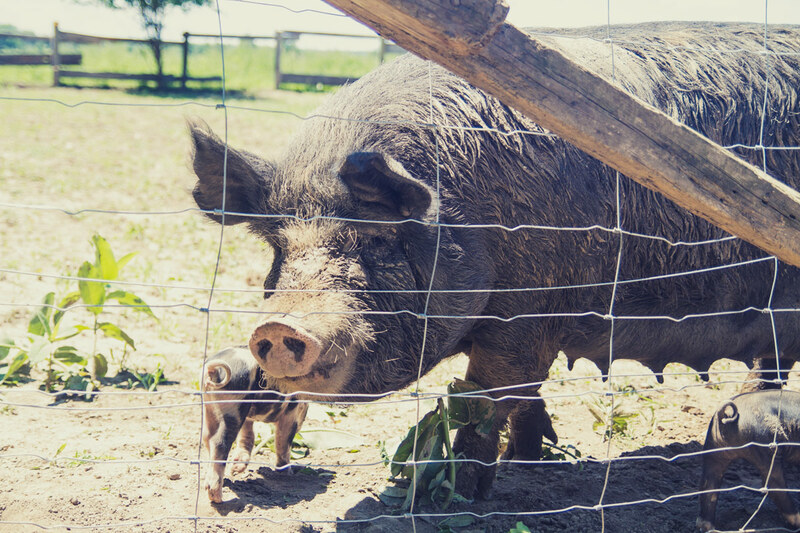 The pigs are free to forage and their 100% organic diet is supplemented by microgreens from Greenbelt Greenhouses, organic fruits and veggies from our vendors (Village Grocer, Nature’s Emporium), as well as all of our #2 veggies & herbs. Our pigs are ‘finished’ in the happiest of environments where beer and fruit wine extract is added to their rich diets. Our final trick in providing the best tasting quality meat possible is the addition of hops to their diet. A natural sedative, hops are the ingredient in beer which give it its aroma and bitterness. We believe in maintaining the integrity of heritage breeds. We offer our pork and beef custom butchered, wrapped and frozen. WE HAVE 2 HERDS OF CATTLE; IRISH DEXTER & SCOTTISH LONGHORN. An ancient breed of bovine from Scotland. Producing delicious, lean beef (as Scotties are insulated more by their coats than by their fat). The smallest and oldest purebreed of domestic bovine, dexters are a dual purpose breed and produce a milk high in butterfat (4%) and dark, marbled meat. 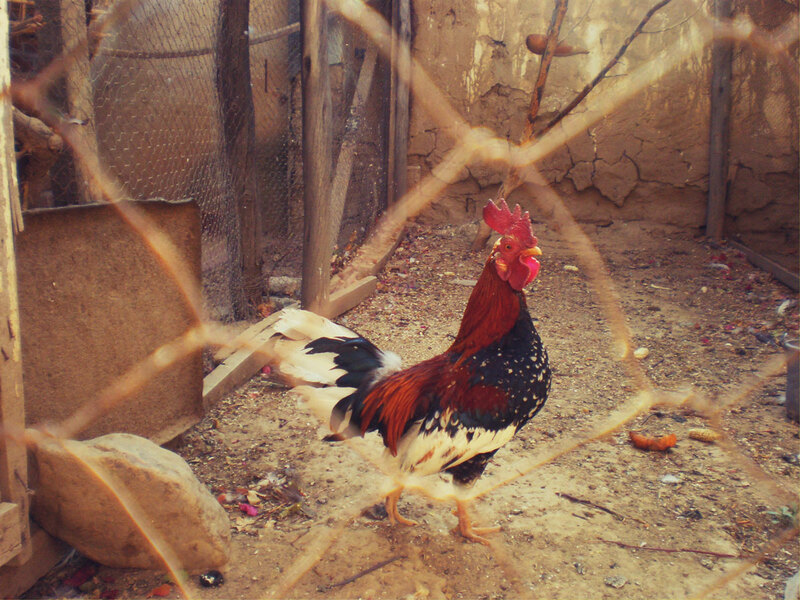 CHICKENS; GUINEA FOWL, GEESE, AND OTHER BIRDS; SEASONALLY AVAILABLE. FREE RANGE EGGS AVAILABLE AT LESLIEVILLE FARMERS MARKET.